Your loved one will adore cuddling up in complete luxury when that chilly winter wind blows with this ultra-soft, embroidered blanket- a wonderful personalized gift for everyone on your list. Snuggle up with the ones you love under this thick and cozy personalized Sherpa blanket this winter! This personalized blanket features Micro Mink material on one side, giving it seriously smooth softness, as well as faux lambs-wool Sherpa material on the other which further fills out the weight and thickness of the blanket. It’s like a warm hug to wrap around you as you read a book, catch a movie or maybe even eat a little ice cream after a good family dinner. It’s particularly fantastic as a personalized gift for someone who likes to cuddle up and be warm on chilly fall and winter evenings – perhaps with a big cup of delicious hot chocolate! 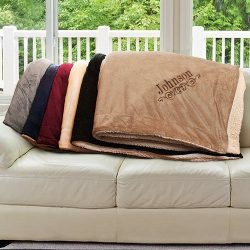 The options for how you’ll enjoy this generously sized 50″ x 60″ personalized Sherpa blanket are endless. Some of the terrific parts about this blanket are the options for personalization! You can choose from six different blanket colors (camel, navy, burgundy, cream, black or grey) and you can also choose a thread color to be used for your specific name personalization. The embroidered name appears diagonally near a corner of the blanket and is accented with a lovely filigree design. The combination of blanket color and embroidery thread color ensures you’ll find a winning combination that looks great in your home and matches the gift recipient’s favorite color choice. Order a personalized throw blanket for yourself and anyone else on your list who enjoys curling up with something cozy on chilly days and evenings! There’s nothing like a soft, cuddly blanket on those winter nights. Having it personalized is the perfect touch, a way to show that the person is special to you. My favorite Christmas Gift on Christmasgifts.com is this beautiful blanket. First off blankets are great for anyone – any age. Nothing beats a soft blanket to snuggle up in, imo. Love that they have a variety of colors, and since you can get them personalized, very affordably, they the perfect gift for everyone on your list. My favorite Christmas Gift on Christmasgifts.com is this blanket. It’s beautiful and looks very cozy. Merry Christmas from my famimy to your family thia holiday season. The gift I would really like @ChristmasGifts.com is this blanket. It is not even for me. I would like to win for my mom. She is cold a lit and her favorite blanket is old and falling apart. She wants a new blanket buy with me being on SSI it is hard to buy it. She has had a very hard year and to win this would be the best gift ever. Thank you for the chance to win. Good luck again everyone. Love this blanket! So personal and perfect on these cold winter nights! Would love this …a great gift for anyone ! I would love this blanket for my sister. She needs a warm blanket to keep her and daughter warm! Looks so warm and comfy!